Jimmy Cricket has paid tribute to the UK’s National Health Service, which turned 70 earlier this month. The NHS was born on 5 July 1948, with the promise of healthcare from cradle to grave, free at the point of use for everyone. Today, it is the UK’s largest employer, with more than 1.5 million staff from all over the world working in 350 different careers. Its budget for 2018-19 is around £125 billion. 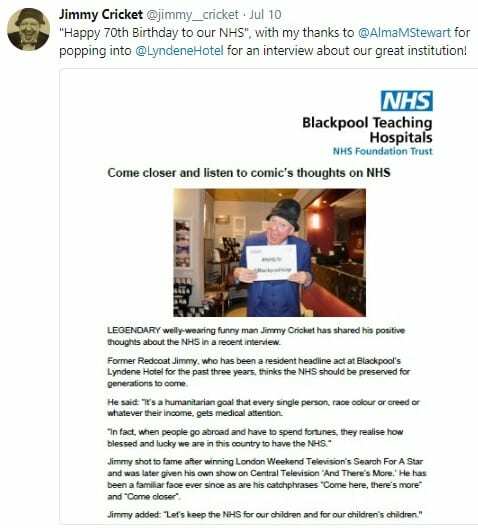 In an interview for the Blackpool Teaching Hospitals website (NHS Foundation Trust), 72-year-old Jimmy – described as a “legendary welly-wearing funny man” – insisted the NHS should be preserved for generations to come. He said: “It’s a humanitarian goal that every single person, race colour or creed or whatever their income, gets medical attention. NHS70 is running celebrations throughout the year – for details on how to get involved, visit the NHS70 website.